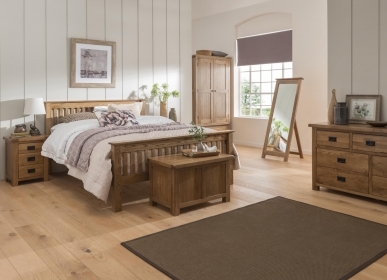 The Bordeaux chest of drawers is a stylish addition to any bedroom. With ample space for clothes in the two larger drawers and smaller items in the top drawers, the 2+2 chest features punctuated drawer fronts, metal handles and comes in a warm lacquer finish. Lovingly built from American White Oak, using traditional techniques, this piece of furniture is long-lasting. Dovetail jointed drawers and traditional tongue and groove backs and drawer bases make the item resilient and durable.